Carrying a full sized wallet can be so frustrating. They just get so bulky! Carry a small ID holder wallet instead! Going slim is the way to go. Carry the necessities with this slim keychain wallet. This really is the perfect way to carry what you need. This slim ID carrying has three pockets on the inside; one for your ID and the others for your most frequently used cards. There is even an extra pocket on the outside to put a little cash or another card. The little wallet measures at about 4.25" x 3" and snaps closed with a metal snap button. A keychain ring is attached to the corner so that you can keep it attached to a belt clip or your purse for easy access. It's the perfect thing for a student or employee who constantly need their ID to access rooms or buildings. 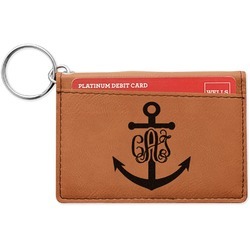 Personalize your wallet with a fun monogram, font, or shape of your choosing. You can choose to either get a double or single sided wallet. 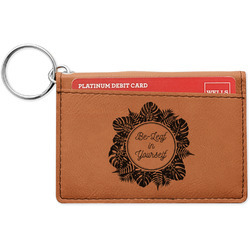 Your design will be laser engraved into the leatherette creating a black color. If you have any special design placement requests or questions, just give us a call. We are always happy to help. Check out our other leatherette accessories in our Apparel + Accessories section. There are money clips, bifold wallets, checkbook covers, and more!